Accent your backyard garden area beautifully with this Baluster Garden Bridge. Use it to complete a pathway over a small moving stream, or simply use it to connect two areas in your backyard. The possibilities are endless, and any option you choose will definitely get all your friends and family marveling over its beauty when they come over for those backyard summer cookouts! This unique bridge is American Made out of Western Red Cedar Wood, by Amish craftsmen out of Pennsylvania. These Amish woodworkers take special care to ensure you're getting the highest quality garden accents available! Being crafted out of Cedar Wood is essential to the product longevity, as the natural oils in cedar help deter damage caused by bugs or even water. Choose a stain as well to further seal the wood, ensuring that it will last for years to come! Do give us a call if you have any questions, at 1-866-272-6773. We would love to hear from you! 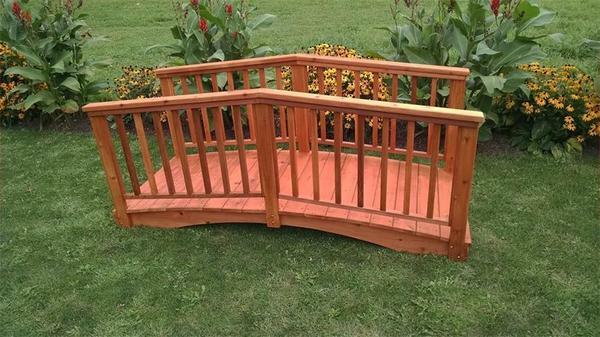 *The Amish Cedar Wood Baluster Garden Bridge ships via freight and may require an appointment for delivery.